Minoosh Zomorodinia and Zulfikar Ali Bhutto chose the plaza right outside of the Castro Muni station, at the top of the busy staircase, right in front of the entrance to the local SoulCycle. There, the two Bay Area artists -- who are both Muslim -- each took two corners of a green cloth and laid it over the sidewalk next to a Brownie Scout's cookie-selling station. Then, joined by a small group of allies, they knelt to the ground and began to pray. The “prayformance” (Bhutto’s word) was the sixth iteration of Side by Side, an ongoing collaboration between Bhutto and Zomorodinia in which the duo pray together in public spaces. 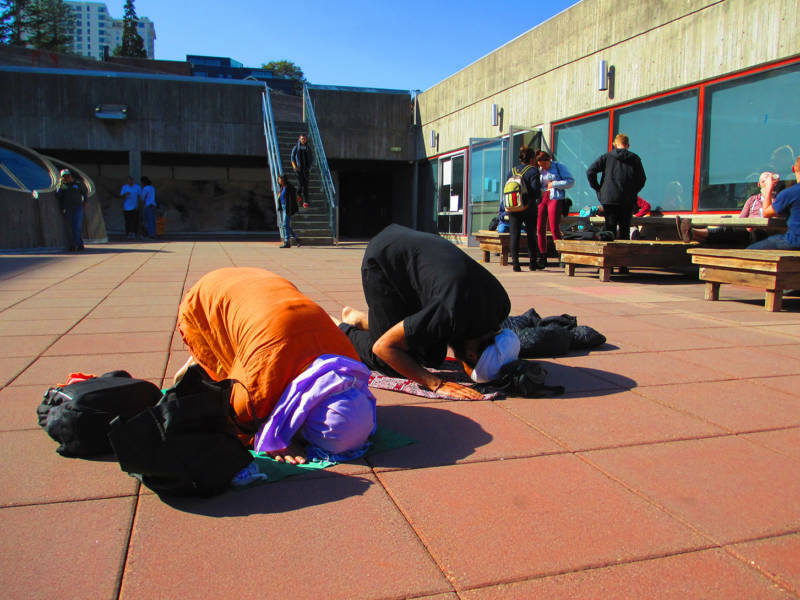 The simple act is intended to force passersby to confront the unfairly contested nature of the Muslim body in American culture, and the multitudes of stereotypes, fears, and desires projected onto Muslim people. Bhutto had the idea for the series in 2014, during his first semester at the San Francisco Art Institute. He was raised in Pakistan in an intensely political family (his grandfather founded the People's Party of Pakistan), and earned two degrees at the University of Edinburgh in Scotland. Although he had experience being an ethnic minority by the time he arrived in San Francisco, he found that being a minority in the United States was more complicated than it had been in the United Kingdom. The feeling was exacerbated when San Francisco buses appeared with advertisements paid for by the American Freedom Defense Initiative asserting that Islamophobia didn’t exist and implying that Muslims were inherently dangerous. What was perhaps worse, however, to Bhutto, was that non-Muslim locals barely seemed to notice the ads. Bhutto also found that he felt a pressure to hide his religion in order to avoid the stereotypes of Muslim men being violent, sexist and homophobic. “I went to a Muslim mosque in the South once and I very much felt like -- this may be a controversial thing to say -- like I was in a gay bar in the 1950s," he reflected. So, he devised Side by Side as a way to become as unapologetically Muslim in public space as possible, and in doing so expose some of the ways that the Muslim identity is politicized in America. He met Zomorodinia, a video artist originally from Iran, and asked if she would join him in the ongoing piece. So far, they’ve performed iterations of the series at Washington Square Park in San Francisco, SFAI, Civic Center Plaza, Union Square, the intersection of Powell and Market Streets and Harvey Milk Plaza. 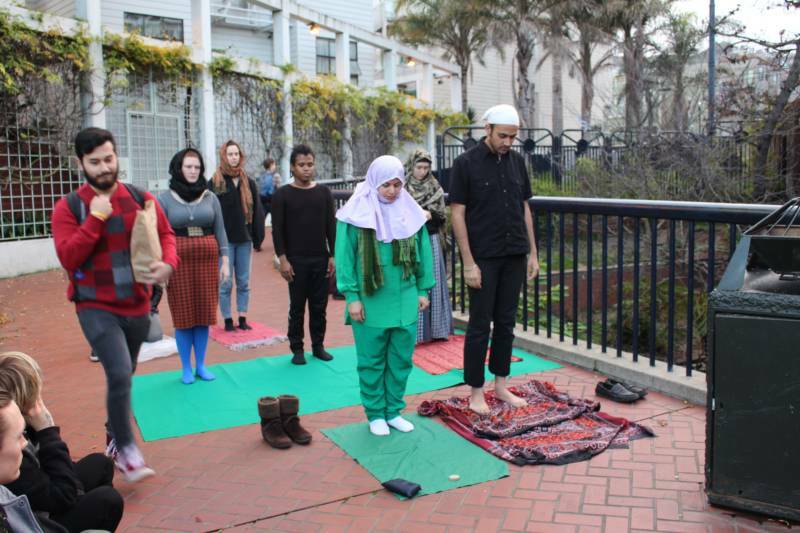 At their most recent performance in the Castro, which was part of 100 Days Action, a series of artistic actions in resistance to President Donald Trump's 100-day plan, Zomorodinia wore a hijab and Bhutto sported a rainbow pin that read "QUEER MUSLIM PROUD." Passersby looked for a moment, then quickly turned away or scurried past to not interrupt. For the most part, people appeared slightly uncomfortable, but not disdainful. 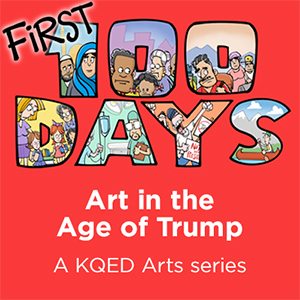 The artist duo also pointed out that the number of participants and supporters who showed up to the most recent performance was much higher than any other iteration -- a surge in support they attributed to Trump's executive order which, according to his own adviser Rudy Giuliani, was conceived as a Muslim ban. "Thank you for standing on our side," Zoromodinia said to the crowd as she ended the prayer. The piece is not only meant to confront Islamophobia. 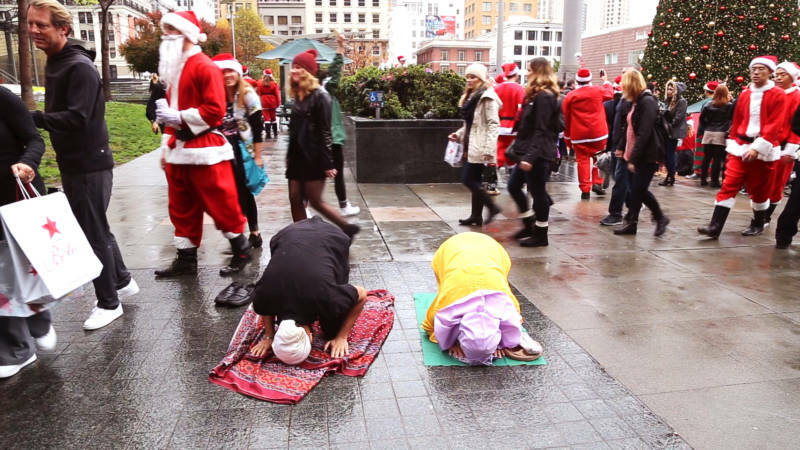 It’s also meant to challenge Islamic tradition which requires women to pray behind men, and doesn’t allow them to lead prayer. Although Zomorodinia said that she prefers not to make political statements, when she prays next to Bhutto, she’s the one leading -- a radical assertion of gender equality. “In many ways, it’s important for us to pray side by side and it’s important for people to join us,” says Bhutto, “because, in my belief, if we keep on separating on the basis of, ‘man and woman are separate, Muslim and non-Muslim are separate, queer and straight are separate,’ then our struggle is never truly unified."